I think it’s fair to say that I’m fairly hyped for Battlefield 4. I declared it my favorite game of E3 earlier this year and have been anxiously awaiting the game since then. These trailers DICE have been putting out about the various aspects of the game haven’t exactly helped keep my hype at bay. 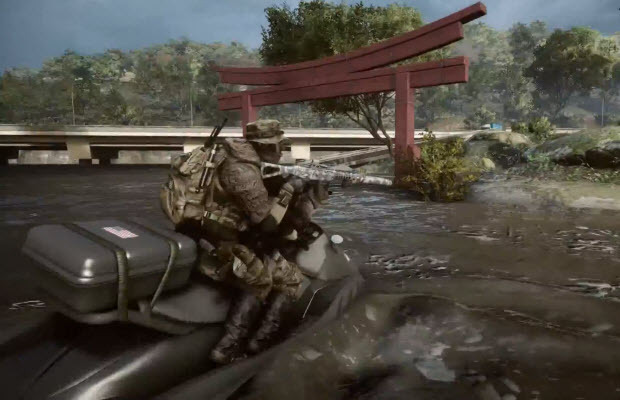 Case in point, the most recent trailer that’s all about the Flood Zone map. Now, this trailer is a bit more laid-back than most, opting to talk more about the development side of the map than the actual act of playing it. However, the insight is still welcome. The trailer spends a lot of time talking about the shifting of player dynamics as soon as the levy breaks in the map. For instance, during the dry period, the streets are deadly for infantry if a vehicle is nearby. However, once the levy is broke, those streets don’t exist anymore, replaced by canals for jet-skis. I’d imagine this shifts the flow of the match into a series of rooftop battles. Sounds like a hell of a lot of fun. Of course, you can see for yourself (kinda), as the beta for the game is going on right now. If you have access, you can play in the Siege of Shanghai map. If you don’t and still want to see the game played, we here at StickSkills have you covered, as Brett McLeod will be streaming some of the beta later today. He should be steaming at around 8 PM EST on our Twitch channel. See you then!